Who wears a poppy then? I do from 01 November. Beautiful, Suffs. 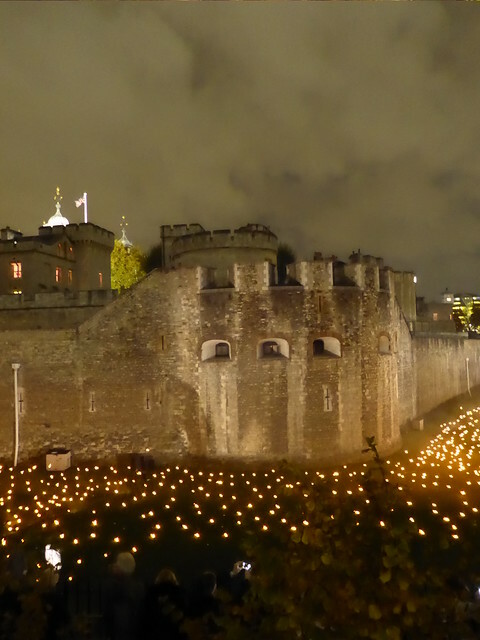 Do you remember the poppies at the Tower of London, must have been 2014, 100 years after the outbreak of the First WW? Hicks - that poem made me tingle. I already have my poppy lanyard & badges, but I will also get a paper one this weekend. 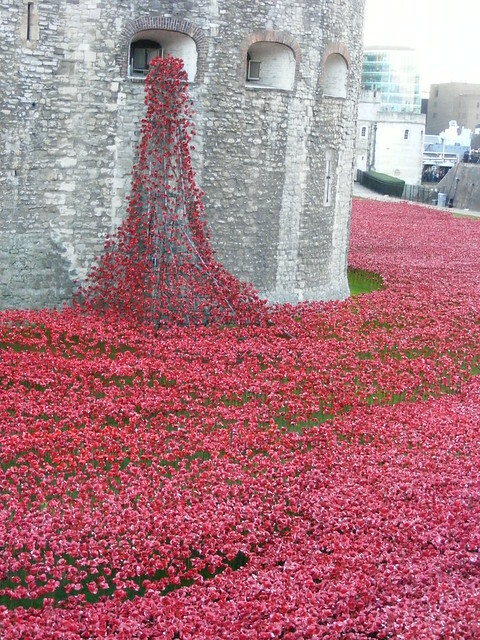 I have one of the poppies from the Tower and it will go outside on the 11th. Our village always has a very moving ceremony and over the last few years we have been allowed to plant poppy crosses beside the local wreats. The flower of remebrance in France is the cornflower. I always wear a poppy. I bought an expensive ceramic one which comes out each year, but I also always put money in the collection box. We always buy poppies and wear them on Remembrance Day ... OH wears them for a few days before when in the shop. I also buy a cross for Pa's younger brother ... in past years if they were well enough we used to take the Aged Ps to the war memorial to place it on Remembrance Sunday and DS would push Pa in the parade ... if not then DS or I would place the cross for him in the week prior and we would watch the service from Whitehall on the tv with them. I'm not sure if we'll be able to get to the usual spot this year as we have a funeral to go to 'up north' but one thing is sure ... my uncle will be remembered ... I promised Pa. I bought my paper Poppy yesterday, along with a lovely pin badge. Last edited by suffolk on October 28th, 2018, 9:29 pm, edited 2 times in total. Sadly, there are those who STEAL Poppy appeal boxes - such creatures make me sick! I passed our town War Memorial today which stands beside the town hall and saw that a fence had been erected round it. The town hall has some rather nice artistic railings and giant poppies had been stuck on them. The fence round the memorial also had some of the giant ones and strings of knitted ones. It looked really contemporary with, I felt, a clear message that future generations will continue to remember. I love the artistic use of poppies which has developed over the period of the 100 year remembrance, when people create something beautiful it means that they care. IMVH&HO - if these companies are NOT donating to the RBL, then they should not be selling things with red poppies on! I adore the outpour of love and respect that we see nationwide when this comes around each year. I have a great, great, great uncle who died fighting for his country over in Greece and have a pile of family history gumpf about him and subsequent family members in a box at the end of my bed. I must go through that soon. As a family we have no photos of him. My oldest living relative in London (my GG aunt) didn't even know he existed until I found his memorial stone by chance in a graveyard near her home in Battersea. How things have changed, where we'd know now if a relative was born, let alone lost their life in such horrendous conditions. I'll grab the next available poppy I'm offered. Lovely poem. It is the simple poppy which is the most poignant. I do like the creativity which has developed though with pretty displays. To me it makes a statement of gratitude that we are all here in a free country able to enjoy beauty. bring it out every year without making further contributions though. Whilst out driving through one of our local villages recently, I noticed that the local school must have been busy ! There were poppies of all shapes sizes and designs throughout the village - on every telegraph pole, in garlands hanging from the village hall, on fences. I don't normally go to church on remembrance Sunday but I think I might this year. Zosherooney wrote: I don't normally go to church on remembrance Sunday but I think I might this year. In our village a pair of soldiers boots for each resident who died during the war are ‘marching’ through the village all week. They’re moved to a different spot each day and will finish their walk in the memorial garden. Seeing the rows of boots as they’re moved through the village is really lovely. Each boot has a poppy in it and a sign saying marching home. I went to Otley on Saturday. There was a huge cascade of knitted poppies flowing from the top of the church, and a huge swathe of even more poppies pouring over the churchyard wall in a stunning and very moving display. I got chatting to an elderly lady who was also admiring the poppies (shame I had no camera!). I told her about my Grandfather and his war service. She told me about her father, who had joined up under-age, before being sent to fight at the Somme. He was badly injured, his life being saved by a German doctor. He lived until he was 92, and still full of shrapnel. Driving though the villages of the High Peaks yesterday we saw many very moving poppy tributes, shadows and silhouettes of the fallen etc. While this is the centenery year of the 1918 Armistice and worthy of special note, I'm also thinking of the remaining few WW2 veterans, many of whom will not see another Remembrance Sunday ... we must remember them and their comrades this year too. Gorgeous, Sue - great pics! Thank you Sue, we did flirt with the idea of going down to London to see this. Because it’s best (only) seen at night it really would have meant an overnight stay so we decided to pass. 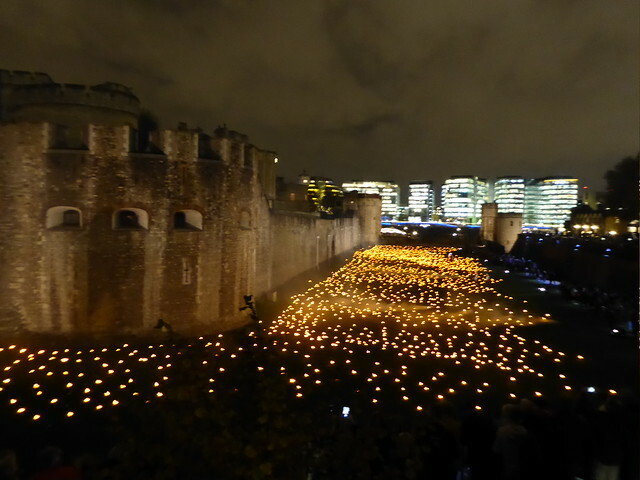 It’s rather lovely to see but as you say I think the poppy installation had more of an impact. Our village is lighting a beacon on Sunday night - along with thousands of others, in addition to the usual remembrance activities, I do hope they get a good turnout. 7.15pm on a school night in Winter, I’m not sure they will get the same turnout as the Queen’s diamond jubilee, which is what they are aiming for. Thank you Sue. 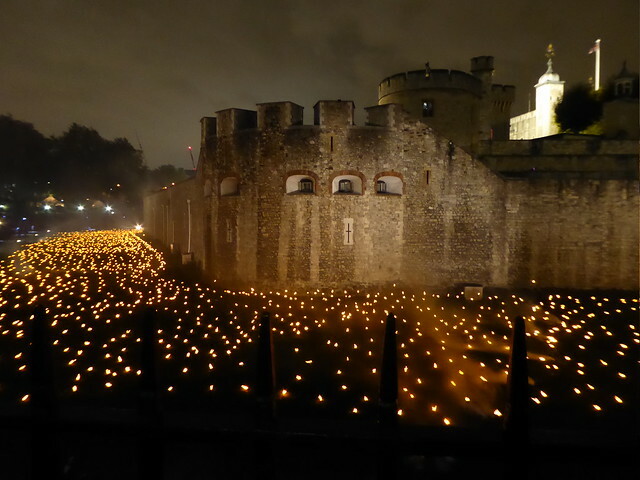 The poppies were thought provoking but these little beacons shining in the darkness seem to say it all. 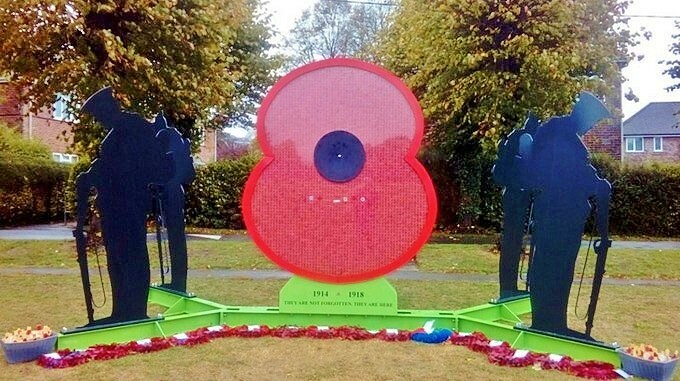 A giant poppy featuring the names of every British and Commonwealth serviceman and woman lost in World War One has been unveiled.The 2.6m-tall (8.5ft) Poppy of Honour includes 1,115,471 individual remembrance poppies.A service took place in Wincanton in Somerset where the memorial made of steel and glass is on display.Each smaller poppy bears the name of a soldier, along with their rank and the date they were killed or went missing. Sam Smalldon, secretary of the Royal Engineers Association in Taunton, who helped with the project, said he "couldn't be a prouder man". "We've had 275,000 people from 37 countries writing out [the names] on the poppies," he said.The memorial will tour Somerset before the end of the year and will be put on show next year at the Tower of London and at Ypres in Belgium. We have a remembrance service happening in our village church. We have decided we will attend. At the funeral on Monday there were three teenagers who'd flown over from the US with their parents ... they were fascinated by the poppies and the story behind it ... they all put their money in the tin and bought their poppies ... they wanted to know more so I've emailed them some stuff to read with their parents when they get home. this is a cake that was made by Emma Jayne Cake Design to help remember the animals that gave for us, remember all gave some, some gave all! The cake which is life size has just been displayed at Cake International, it's a fantastic piece of work/art and I'm sure you'll agree the lovely Emma Jayne (and she is) deserves high recognition for 1 being brave enough to do it (with the attitude of some of todays anti brigades) and 2 for the incredible work and likeness! Not been around. Life , work and health has been getting in the way. My late grandad was a retired RSM in the Devonshire Dorset regiment. He was invited to lay a wreath at the Cenotaph. He spent weeks trying to practice but in the end was not allowed as he had lost his leg many years prior and although he had a prosthetic leg they were no way as sophisticated as the ones that are available today and the mechanism in the knee would not allow him to step back. They said although someone could take the wreath from him but if he couldn’t physically take a step back it would be disrespectful and disbarred him from the honour. Last edited by jrc on November 10th, 2018, 9:33 am, edited 1 time in total. That's a bit of a sad story jrc. Did he lose his leg whilst serving? At least we can remember everyone at our services, ceremonies and quiet moments. Sorry to hear things have been difficult - hope you can take it easy sometime. The cake is amazing Hickey - wow! EM yes my grandad lost his leg whilst in active service. He was born in 1905 and died in 1991. Sadly the prosthetics weren’t as sophisticated as they are now. He lost his leg above the knee and had straps that went around his waist and diagonally across his shoulder. The knee mechanism worked by him using his stump by throwing it forward and locking somehow to make it safe to progress but failed to have any reverse mechanism.